Google News experiments with a lively and visually-rich design that shows images, videos, quotes, but also interesting and popular stories. There's a "featured photo" section that uses images from AFP, The Associated Press, Reuters, marking the first time when Google News promotes stories just because it has the permission to show associated images. If you are logged in, the new interface personalizes all the sections, not just the front page, and you can switch to the non-personalized version to see the differences. 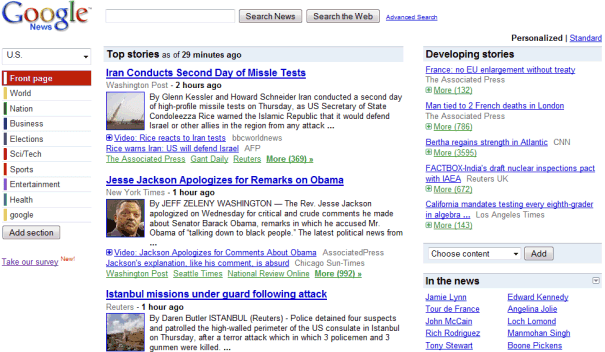 The homepage shows a list of "developing stories". The Sci-Tech section, with more photos. 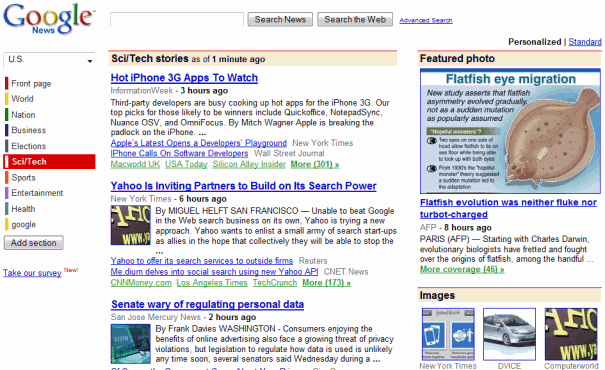 Front-page sections can be minimized and look like iGoogle gadgets. Google News clusters prominently display the main title. The footer is more lighthearted. "All the news that's fit to crawl. Auto-generated from over 4500 news sources, void where prohibited." 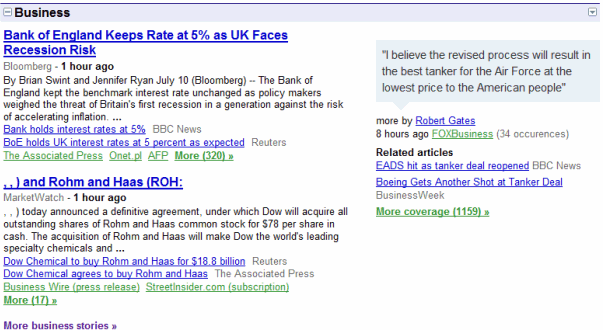 In June, Google News blog announced the new UI, without getting into details. "Over the course of the next few weeks, you may notice a few changes to Google News... or maybe not. You see, we'll be running some experiments on the look and feel of our site, based on an accumulation of user research and feedback, as well as the evolving state of online journalism." Ew. Only 4500 sources? No wonder they are always behind on the news. I think Google News has more than 4500 sources, but this number is much bigger than the number of sources for Yahoo News. Where's the archive? PLEASE don't get rid of the archive. News archive is available at: http://www.google.com/archivesearch. I've had the new layout for several days. It's HORRIBLE. I have to scroll all over the place, and seem to have lost most of my options for customization. I think this is one of the best Google redesigns. I already use Google News much more than before. Don't like it - too spread out. Give us back our two columns. All customizations lost too. The old format just came back - brilliant. How do I revert back to the original layout? I do not like this new layout. Clearing the Google cookie doesn't work for me. I really dislike this new design. It wastes the horizontal space, which is prime real estate for content, IMO. The tabs should go back up top, lose the dopey imbedded links to the gadgets, and lose some of that excessive iGoogle header space as well. For me, iGoogle is all about accessing MY CONTENT, and Google is making it harder to do that! i am not able to get the new layout.. wat shud i do get the new layout?